The radioactive-ikon is only my first-suggestion (4 variant with various transparent parts, but the same object). Since it's gonna be used for several elements, I will try out more suggestions later. The preview is for "Si" and "Ca" together, I tried out a cow for the milk-carton but it was too small for 40 x 40 pixel (upper-right corner) then I tried stripes. I want to thank the commenter's. Just wanted to say that your icons are looking great. Thanks for the effort! I was a bit sceptic about using milk as an example of calcium, because it's not like this element is used for this by man like most other examples. Then again, man-made examples are rare and calcium is an essential part of living organism -- bones, teeth, leaves, and, to quote wikipedia, is the most common metal in many animals. 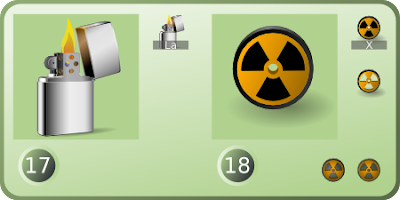 By the way, there's a new supplementary radiation warning symbol for really dangerous radioactivity by IAEA and ISO organizations. using milk for calcium. I first wanted to draw concrete, but couldn't find a item on concrete that was easy recognizable in the small size (a concrete "bag" looks like flour or rice). I would really like to draw leaves or bones, but they are even more untouched by humans (milk is pasteurized and homogenized). If someone have a good idea to calcium icon (a specific item recognizable on 40 x 40 pixel), let me know so I can try it out. Thank you "anonymous" for your valuable insight. The lighter is just awesome. REALLY good work. For the "radio-active-sign" it would make a black dot in the middle. I also want to draw alternatives (something complete different) for the radioactive-ikon, any ideas anyone? 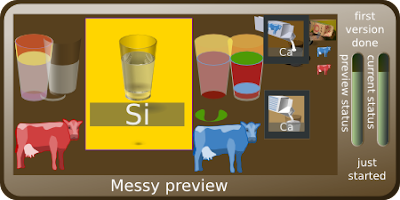 The icons are looking nice, but I don't understand: why is silicon a glass of water? How about a transistor or a microchip? mDVbvB Your blog is great. Articles is interesting! FF2m6K You have a talant! Write more! 3jGIiS actually, that's brilliant. Thank you. I'm going to pass that on to a couple of people. nWrOsK The best blog you have!